Home bike died man Does this picture show a man’s SOUL leaving his body? 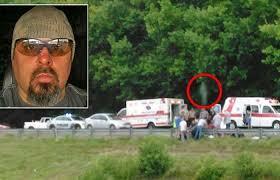 Eerie image of fatal motorbike crash shows ghostly shape floating above the victim! Does this picture show a man’s SOUL leaving his body? Eerie image of fatal motorbike crash shows ghostly shape floating above the victim! Saul Vazquez took image of fatal motorbike crash in Kentucky on Tuesday.He uploaded the picture to Facebook where it has since gone viral.Thousands of people claim it shows the biker’s soul leaving his body. the greatest question never to be answered: What happens to us after we die? For those who believe in an afterlife, this image might just held to confirm their suspicions. Taken by truck driver Saul Vazquez in Powell County, Kentucky, on Tuesday evening, it appears to show the moment a man’s soul left his body. Since Vazquez posted the image to Facebook it has gone viral, being shared tens of thousands of times by people who believe it shows the existence of an immortal soul. Vazquez, from Mount Sterling, said he took the picture around 6.30pm on Tuesday from the cab of his truck while driving along a service road on the Bert T Combs Mountain Parkway. In fact a motorcyclist, who has not been named, was severely injured after crashing along the road. He was taken to hospital where he later passed away from his injuries, emergency workers said. The biker is believed to have been the only person involved in the crash.